New wing owner. Looking for suggestions for both a short term in expensive set of tires to ride locally while refurb of various components &systems and a long term set once all the other details are set for cruising S&SE US...don’t want to wast $ on junk but also don’t want to spend refurb$ on GREAT rubber when ok rubber will do for local 50mi or less runs. smooth, quiet, grippy, and high mileage ..
For economical (cheap) tires on my GL1200, I currently have Shinko Tour Master 230 tires. They are great for around town and day trips. I did take a 2200 mile trip just after installing them. Super sticky, but the soft rubber compound means I only have 8500 miles on the rear tire and it is time for a new tire. The front tire is in much better condition. I would put on a longer wearing tire if I was planning a cross-country trip. I don't do a ton of miles, so removing the rear tire every couple of years forces me to take care of other maintenance. Everyone has their own thoughts on tires, this is just my opinion. Agree with skier - Shinko Toastmasters for short term, Michelin Commander II for long term. The new Dunlop E4 tires are also available for the 1200 and are supposed to be good for up to 30K miles on the 1800s, so with lesser weight of the 1200 should be a good buy - have not tried them yet. 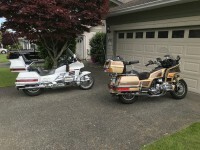 I am a new goldwing owner myself. Have not put 5 miles on bike yet. Still working on a couple of issues. I just purchased a car tire for the rear and Shinko Tourmaster 230 for the front. I have been doing some digging and I would like to try out the "Darkside" thing. Anyway you can not beat the price of under $140 total for tires. I remember paying that easy for a single tire on a past bike. If I hate the rear tire, it only cost me $60. The CT will be different, but give it a good try. Need to put 2K to 3K miles on it to make a good decision; however, if it does invoke the "I'm not feeling safe" at any time, change. CT profiles are different as well. Try to find one that has a rounded profile instead of a square one, makes a difference. I had a CT on my 1800 and when I first started with it, the initial difference did make me slow down and take my time. By the end of my 5000 Km trip, never noticed a difference. Going to install an Austone tire on my 1500. Shinko 230 tourmaster front and rear. Great value. No regrets. well it looks like the shinkos have it... on to the next issue. 2 years old, dry rot, covered carport. Junk, and they would not 'make it right'. The Shinko Tour Masters will give you a good ride, they are good in the rain and hold onto the road quite good. I get one season out of the rear tire, the front one is good for a few seasons.